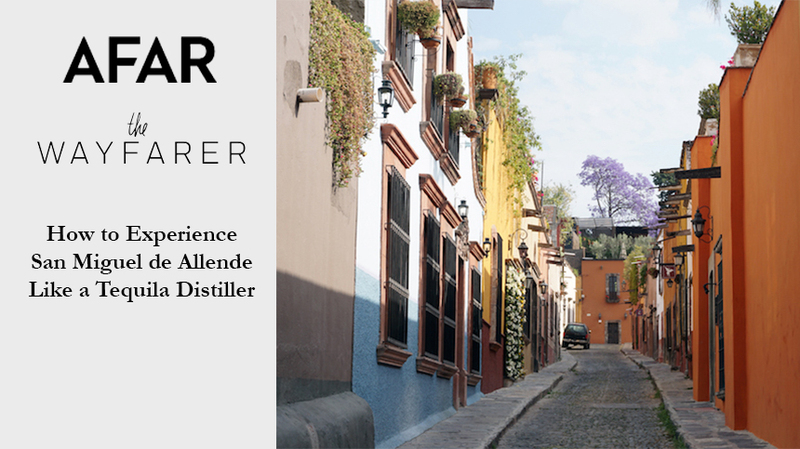 Mexico's first female distiller calls the colonial city her spiritual home—and she's not the only one. González grew up in Mexico City and discovered her love for tequila (the industry as well as the drink) in her late teens. After becoming the first woman to be certified as a master distiller, she and entrepreneur Bob Pittman launched Casa Dragones Joven tequila in 2009 and chose San Miguel as home base for their brand. But while González had spent her teenage years piling into the car with friends for weekend trips to San Miguel de Allende, a love of the city wasn’t the only reason Casa Dragones set up shop in the sleepy place. San Miguel's temperate weather, bohemian vibe, and plethora of rooftops with sunset views has made the city a popular “secret” vacation destination and retirement spot for Mexicans and ex-pats alike since the 1950s. But under that mellow surface, San Miguel de Allende been a hotspot for artists and revolutionaries going all the way back to the Mexican War for Independence. The humble textile town became legendary when the city’s most celebrated son, Ignacio Allende, helped lead the charge against the Spanish crown, aided by his elite cavalry, Los Dragones. It was that deep-seeded Mexican pride that resonated with Casa Dragones, because González is a bit of a champion herself—a tequila champion. From the beginning, González has believed in the responsibility of the agave distillate industry to establish tequila as a source of pride, and to become a contender on the global spirits stage—and that includes both mezcal and tequila. "Tequila doesn't belong to anyone, it belongs to Mexico," González says. And maybe that's why San Miguel is such a perfect home for the brand: this fierce commitment to elevating traditional Mexican art and culture as a source of national pride is palpable throughout San Miguel. So how do you explore the new and hip San Miguel like a tequila distiller? Snag a table at Aperí, the acclaimed restaurant attached to San Miguel’s first design hotel, Dos Casas. Architect and entrepreneur Alberto Laposse transformed his personal home, complete with 1930’s Bauhaus furniture, into the hotel six years ago, launching a wave of new design-focused hotels and restaurants. Years later, Aperí—helmed by Top Chef Mexico contender Matteo Salas—is one of the city’s hottest restaurants. The constantly-changing menu focuses on fresh flavors and innovative techniques, all while incorporating traditional Mexican ingredients. If you’re feeling brave, go for anything with huitlacoche. Grab brunch at Cumpanio. Another Laposse enterprise, Cumpanio started as a beloved artisanal bakery and has since grown into a popular brunch spot. Steps from the main square, the bar (well-stocked with Casa Dragones tequila) is a perfect place for an afternoon Bloody María. Take your lunch with a side of art at Moxi inside Hotel Matilda. Designed by Marco Valle and named after Diego Rivera's painting, Matilda (a replica hangs in the lobby), this boutique stay is truly an art space. Although the hotel is home to evocative pieces like Bosco Sodi’s Pangeas and Spencer Tunick’s famous photo of 18,000 nudes in Mexico City, the hotel feels far more like the home of an eccentric art-collector than it does a cold gallery. And as a product of culinary genius Enrique Olvera, the man behind Mexico City’s famous Pujol restaurant, Moxi is no less artistic than its surroundings. Olvera combines classic European techniques with traditional Mexican comfort food, coming up with delicious hybrids like eggplant mole with artichokes, or ceviche made with dark beer, wheat, and avocado. Enjoy the view during happy hour at Luna’s Rooftop Bar. When Rosewood opened their property in San Miguel, they picked the best spot possible. The resort is perched just high enough to see a sweeping view of the city, including the famous Parroquia de San Miguel church and the hundreds of rooftop terraces. With fire pits set in the middle of tables and a cocktail menu that goes beyond the margarita, Luna’s is a perfect place to spend an afternoon. Check out the new trend toward communal spaces and projects. Although the colonial city can feel frozen in time, San Miguel is constantly evolving, and people do really come together in San Miguel. There are already a few alcove clusters of boutique shots, and just two months ago, the city saw the opening of Mercado Centro, an elevated food hall concept housed under the roof of an old super market. The Mercado features around 15 restaurants and includes a mini Cumpanio bakery, Panio. And even more recently, the Dôce 18 concept house was unveiled to the public. Dôce 18 is another collective project that brings together some of the city's best design, fashion, art, and cuisine in the same space, with enough to keep anyone busy for an entire day.